AMURT NZ raised at least $1800 NZD for our teams working on the ground in Nepal. The funds comprise of $900 from a Nelson fundraiser, $200 from Auckland, $340 from margii donations around the country and $360 from AMURT NZ funds. In Auckland, on the 18th of May 2015 Dada Shuddhatmananda and Dada Vimaleshvarananada had been interviewed by Alastair Lynn of Harbour News regarding their Nepal Earthquake relief efforts. Read the full article. 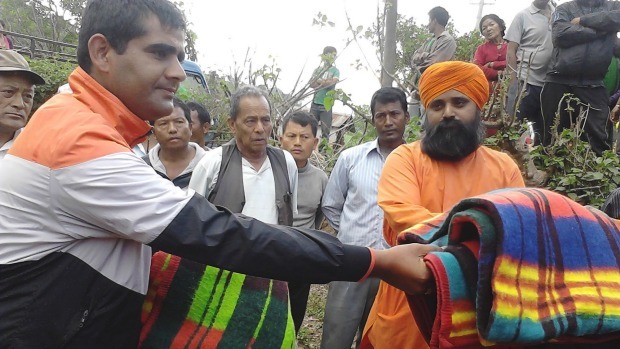 Ananda Marga volunteers distribute blankets at a relief camp in Nepal. In Nelson, on the 7th of May 2015, Stacey Knott of Nelson Mail features East Street cafe. Owners Tejas Arn and Vikki Radbourne have decided to give AMURT NZ half of their takings from a dinner service on the 6th of May to help with earthquake relief efforts in Nepal. AMURT NZ received a total of $900 from the cafe, $50 of which were from donations as well.